Kaftans have been making a popular comeback recently, as an easy solution to evening wear dressing, compared to having to fuss around with covering up a maxi dress. This piece by Elie Saab I think shows just how timeless the design can be. Beautifully draped and pleated fabric, and an unusual shade of orange; it stays close to the traditional silhouette of a kaftan, but with a more modern, sleeker style. If you were to say 'tangerine kaftan', I'd more likely raise an eyebrow then utter an "ooh!". However this floaty ethereal frock is kinda fetching. Although you'd need a little height to carry all that fabic without drowning in it. And a lot of money too! Only retailer that does elie Saab is Harrods! After that the nearest is France! Love the new runway looks. 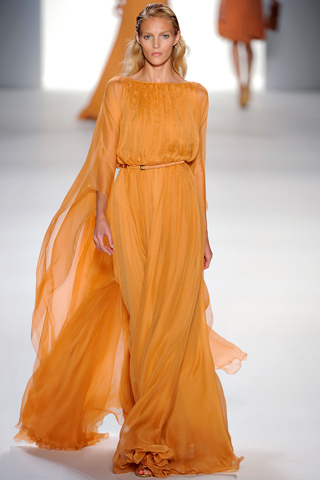 Lotsa hijab friendly dresses out there and especially love Elie Saab! salaam! ok need desperate help! in panic mode - my students proms in 3 weeks time n i hv been so busy n am soo busy over the next few weeks with exams hvnt had a chance to think about it...would u be a sweetie n suggest something please??! a lil colour, suitable for a young teacher n not too expensiv!